After breakfast, drive to Mandawa located in the Shekhawati region. Upon arrival, visit the village of Mandawa features winding streets, beautiful havelis with naive and colorful paintings and a special atmosphere. Shekhawati, especially the Mandawa region is a veritable museum of open-air painting in Rajasthan and was the favorite place of the Marwari community, great merchant families of India from the 17th to the 19th century. These wealthy merchants built sumptuous residences, the "havelis", beautifully decorated interior and exterior frescoes. Overnight at hotel. Departure by road to Bikaner known for its camel farms. After lunch, tour of Bikaner. This desert town in the north of the state of Rajasthan and crossed by caravans coming from the Far East and Arabia, was founded in 1488. The city still benefit from the arid climate that surrounds it as protection against enemies but the old town is however defended by impressive fortifications. Visit the Fort and the old palace. Junagarh Fort, built in the 16th century features beautifully decorated palaces. Overnight at hotel. Departure for Jaisalmer, the Golden City and explore this fascinating medieval city of yellow sandstone, lost in the depths of the Thar Desert. Open-air museum, unrivaled throughout India with its strong, beautiful haveli Patwon-Ki and Lake Sagar Tank, Jaisalmer has its historical importance and its wealth to its role as a caravan stopover between India and Persia, Arabia and the West. Evening, sunset to chhatri, cenotaphs of Maharawal, rulers of Jaisalmer. They were built in the former royal garden, located on a rocky hill near a small lake below. Overnight at hotel. Visit Jaisalmer, this beautiful city situated inside a huge fort, the second oldest fort in Rajasthan whose interior is a maze of courtyards and halls. Stroll in the most populated area around the fort where the bazaar and the most beautiful havelis are, and visit the magnificent Patwon Ki Haveli, home of brocade merchants. Close to the walls of the lower city, Lake Gadisar a rainwater retention lake created in the 14th century, the main source of drinking water for the entire city at the time. In the late afternoon, drive to Manwar and installation camp located in the dunes. The concept of camping tent seems to date back to the 17th century when the emperor went to the battlefield. These existing camps are provided with all comforts and offers the memory of an unforgettable night. In the late afternoon, camel safari in the desert at sunset. Overnight camp. Morning departure to Jodhpur, former capital of Marwar. On arrival, tour of the city known for its fort, Mehrangarh Fort, overlooking the town like a sentinel. Built in 1459, it contains many palaces built by successive rulers. Jodhpur is commonly known as the Blue City because most of the houses in the old city are painted that color. Blue indicates that these houses belonged to members of the Brahmin caste. 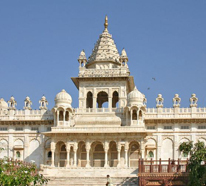 Jaswant Thada and visit of the royal cenotaphs. Beautiful white marble mausoleum in memory of Maharaja Jaswant Singh II, is nicknamed the Rajasthan Taj Mahal. Then walk to the fortified in the colorful and lively bazaar, Sardar Bazar, around the Clock Tower. Overnight at hotel. Morning drive to Mount Abu, the only hill station - 1200 meters - Rajasthan located at the southern end of the Aravalli hills. Built around a lake, it is also an important pilgrimage center, known especially for its entire Jain temples Dilwara referred to as one of the best examples of religious architectural excellence. Everything is carved marble and pure white. By late afternoon, boat ride on Lake Nakki to enjoy the beautiful view of the sunset. Overnight at hotel. After breakfast, drive to Udaipur. Stops in villages along the road to enjoy the rural life, wander the markets, see crafts, etc. On arrival at Udaipur, transfer to hotel and free time to stroll along the lake at sunset. Overnight at hotel. Day tour of the white city, Rajasthan's most romantic. With its marble palaces with undeniable charm with towers, domes and intricately carved balconies, Udaipur offers an enchanting spectacle. Visit the City Palace, a huge palace of 1567, Rajput and Mughal mixture of influences surrounded by crenellated walls with panoramic views of Lake Pichola and its two islands. Continue to Jagdish Temple and Sahelion Ki Bari visit, garden bridesmaids of the Maharani. Then the Nagda site where many shrines and temples are located. In the late afternoon boat ride on Lake Pichola where you can admire the magnificence of the royal palace and the city. Overnight at hotel. Morning drive to Chittorgarh. Chittorgarh Fort is considered the largest fort in India and best preserved of the state of Rajasthan. Known of Chittor, it was the capital of Mewar and extends majestically over 280 hectares. The walls of this fort in heavily marked story contains numerous monumental ruins that have largely inspired the imagination of writers for centuries. Continue to Bundi and arrival, transfer to hotel. Overnight at hotel. Morning tour of the city with the strong and the Taragarh Palace. The fort, built in 1534, is accessible by an impressive gateway that provides a magical view of the surroundings. Visit the palace of Bundi which one of the pavilions contains a gallery of murals in the turquoise and green hues that adorn the palace. His paintings of great finesse, portray moments of life of Lord Krishna and illustrate the hours of court life Rajput. Walk in the heart of the city with its medieval charm that closes colorful markets and bazaars. Overnight at hotel. Morning departure for Jaipur. 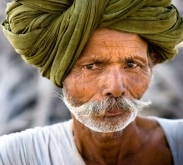 On the road, visit the Amber Fort, the ancient capital of Jaipur Maharajas. This former 16th century fortress, built atop a rocky outcrop, is accessible by elephant. Arriving in Jaipur, stop at the legendary Palace of Winds, Hawa Mahal, with multiple openings. Built in 1799 and close to the City Palace, this amazing architectural fantasy was built for women of royal families so they can attend processions without being seen. Overnight at hotel. Day dedicated to the visit to the capital of Rajasthan. Jaipur, or the Heart of Rajput chivalry, built in 1727, is known as the "Pink City" because of the color of its walls. Visit the City Palace and sumptuous museum containing many treasures, the Astronomical Observatory and its amazing instruments that still admired today. In the afternoon, pedicab ride for you to take the pulse of the old city of Jaipur, which is full of markets, colorful bazaars and shopping wisely aligned under the arches along the avenues. Overnight at hotel. After breakfast, drive to Nahargarh, the Tigris fortress built by the Maharaja for his new unofficial women. Panoramic view of the pink city. Then visit the Jaigarh fort. Very nice collection of weapons of Maharaja with the widest cannon on wheels in the world. Departure to Delhi. Upon arrival, transfer to the airport for the return flight. Nice hotel not far from Jaisalmer. Small bungalows around a beautiful garden. Pool and spa center. Large rooms well decorated and quiet. Rooms for practical bathroom. The Garden Restaurant Offers a fine served buffet table or kitchen. This is an absolutely charming and relaxing place to enjoy the atmosphere of the desert. Courteous and prompt service. The rooms / tents are spacious and comfortable. Dance and music every night. Spectacular location for this former palace full of history. Converted into a hotel, the patio is a must that offers stunning views of the city and the Nakki Lake. The place has kept the charm of the palace "Heritage" with large rooms and an atmosphere of yesteryear.